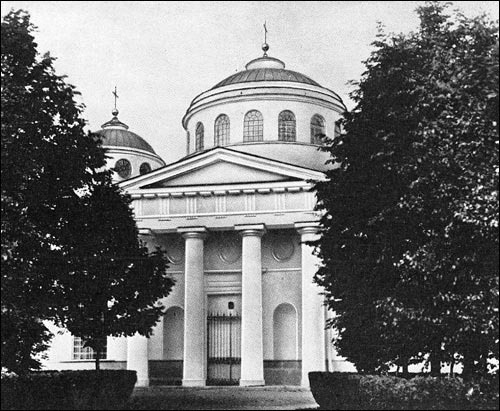 The St. Sophia Cathedral was built by Scottish architect Charles Cameron in 1785 for Catherine the Great in the hamlet of Sophia on the far side of the Imperial Park. She built this church as a symbol of her "Greek Project". 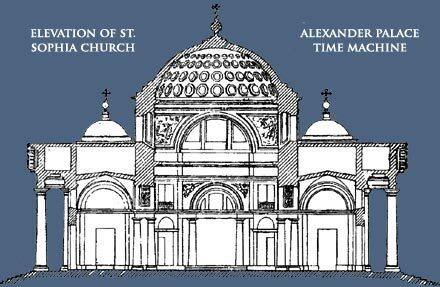 The church was named in honor of St. Sophia in Constantinople, which was the mother church of the Orthodox world. Since the middle of the fifteenth century the Byzantine cathedral had been used as a mosque by the Ottoman Sultans who had conquered the city on May 29, 1453. It was Catherine's dream to liberate Constantinope from the Turks and restore the cross to the dome of St. Sophia. Later she went so far as to groom her second grandson Constantine - who was named for the founder of Constantinople - as the next Orthodox ruler to sit on the resurrected throne of Byzantium which she would restore by force of arms. The spacious interior of the church was dominated by four massive granite columns with gilt bronze ionic capitals. After the revolution was church was incorporated into a military camp and was gutted. Today it has been returned to the church and it is currently being refurbished. The redecoration has not been in the original neoclassical style of Cameron. The military camp is still there and many of the people who attend liturgy are soldiers and their families. There is now a very active church school attached to the cathedral. The evidence of bullets, shells and fire from World War II are still easy to observe in the scarred interior and exterior of the church.